Online Subtitle Services have fast become one of most commonly requested services available via the internet. Increasingly, huge numbers of people are setting aside traditional terrestrial channels, even cable or satellite services in favour of watching their favourite television programmes through internet enabled TVs, tablets or even smartphones. The availability of subtitles in these shows is invaluable in appealing to a global audience both directly through translations and indirectly due to SEO benefits. Want to learn more? Here’s a summary of our online subtitle services. 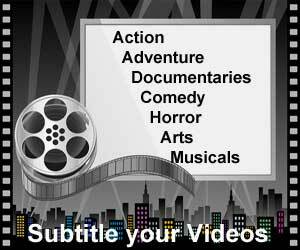 The use of online subtitle services can be highly beneficial to any company or individual creating and/or publishing online video content, large or small. Companies like Netflix, Amazon, YouTube, Vimeo and even Facebook feature a whole host of online content and services centred on bringing in viewers for entertainment, the spread of information or advertising. Subtitles allow companies and individuals to garner bigger audiences globally through translation, SEO possibilities and accessibility. Professionally written, accurate and reliable subtitling solutions for your business. When considering subtitle formats, it is important to make a distinction between closed captioning and subtitles. Closed captioning is a service aimed at providing onscreen text to aid deaf and hearing-impaired viewers. Captions can be open or closed (meaning burned onto a video or saved as a text file which can be turned on or off). Subtitles on the other hand appear usually as white text within a black box at the bottom of the screen. When it comes to broadcast or video, subtitles are actually similar to open captions in terms of they are burned onto the screen effectively as an image and are not removable. For online subtitles, however, this is not usually the case. When uploading subtitle files for use online, it’s preferable to retain the text format of the file to retain searchability and SEO benefits. For online subtitles, the formats commonly used can be very different to broadcast, and the most common are below. Different subtitle formats and extensions are required for different media players on the internet. The three most common types are .SRT, .WebVTT and SAMI (SMI), but there are a host of others out there too. .WebVTT (Web Video Text Track) encompasses all media players embedded within HTML5 websites. HTML5 is the latest standard for browsers to display and interact with web browsers. .WebVTT is fast becoming more popular due to its extra formatting options as compared to .SRT. SAMI (SMI) format is used for Windows media player. The SAMI format was developed by Microsoft and stands for ‘Synchronized Accessible Media Interchange’. There are many different ways to categories subtitles. Subtitles could be mandatory (forced) in which case they cannot be turned off or they can be optional, in which case the viewer can choose whether to turn them on or off depending on personal preference. Subtitles can also be hard coded or saved as separate streams of information added onto the video at a later stage, depending on whether they are encoded into the original video or added at a later stage into the container. So there you have it, everything you need to know to create great online subtitles for your clients or customers. If you would like more information on how Capital Captions can help your company grow in the online world of subtitles, contact us at info@capitalcaptions.com or Get a Quote.